Hi there, fellow read-a-thon-ers! Please accept my apology for the late posting. I was on a deadline for a review today. I started reading it at midnight last night and promptly fell asleep about a 1/4 into the book. So, had to finish it today. Now that it's out of the way, time to get down to business! These are the giveaways and mini-challenges that are being hosted by other bloggers and authors...the generous souls. =O) Thanks very much to all of them! There may be more added to this list later so be sure to check back. All the prizes for the mini-challenges and giveaways I host here will come from the PRIZE PAGE. 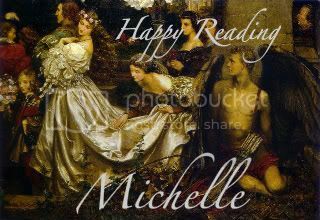 My first mini-challenge, posted today in the starting line post, was to do a post or link to your reading list, pic, etc. for the week. 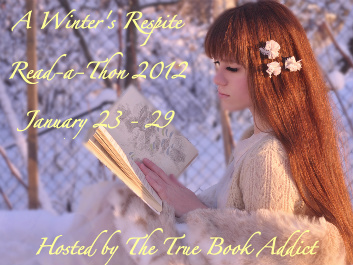 You can enter this by entering the link to your post, Tweet, Facebook note, Goodreads read-a-thon shelf (however you are participating), at the Starting Line post HERE. I'm keeping this mini-challenge open until Saturday morning at 8:00am CST for people who will only be joining us for the weekend. If anyone has any questions, leave me a comment, tweet me at the #WintersRespite hashtag, or email me at truebookaddictATgmailDOTcom. I wanted to take a picture of my reads but all of them except Scorpio Races are on my kindle can I just take a picture of the book and my kindle or should I find the covers online? I'll definitely post a pic of my tbr soon. I've got trashy Romance and some horror to read this week. Also, SO excited to do this, I have one book down from my pile. LOL.